aussi bien des artistes proches de Douglas à Londres (Artists Anonymous, Richard Crow, Coum Transmissions, ...) que de créateurs plus historiques comme Rasheed Araeen, Joseph Beuys, Daniel Buren, Andre Cadere, Gilbert & George, Susan Hiller, Anne & Patrick Poirier... Au total, une soixantaine de pièces. Le texte est comme une histoire expérimentale de l'art pointant des événements qui relèvent de l'accident de travail et ont été décisifs dans le parcours d'un artiste ou le parcours d'une œuvre. Excités par ce défi, nous nous sommes demandés ce que nous pourrions faire de ce catalogue imaginaire. Alors Matthew Burbidge a filmé une soirée pendant laquelle Douglas monologue dans un pub, délirant et précis, dans les méandres de sa mémoire. David Garchey a mis en page le texte que David Evrard a illustré d'images qui n'ont pas de lien direct avec celui-ci, proposant une équivalence aux objets trouvés. Avec Komplot et Le Commissariat, Jean-Philippe Convert sera l'interprète francophone de Douglas. "We cannot produce accidents to order" (William Burroughs and Brion Gysin, 'The Third Mind', 1978). Douglas Park is a London based writer, poet, raconteur whose art practice deals with indexing, fragmentation and mimetic cultural transmission. One of his areas of research is the examination of marginalized elements of contemporary art history through the prism of the "accident". This is the starting point for this exhibition which takes the form of both a prototypical model for cultural remapping and a hypothetical historical flux density measuring device. 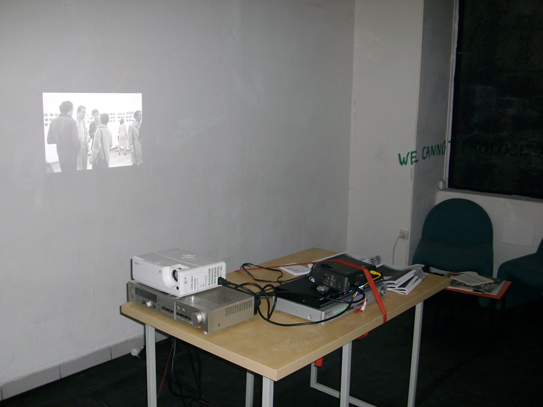 To facilitate his research, Komplot have invited a group of artists to respond to a privately circulated underground text in which Park created a lexical analysis of accidents that have occurred in contemporary art history (be they personal setbacks ; interpersonal, political, legal, media and public adversity and backlash ; grievances and disputes ; resource and facility shortages ; technical hitches ; conservation, storage and transit issues ; changes of mind etc.). Matthew Burbidge has created a free-wheeling film portrait of Douglas Park, a late night joyride through the landscape of post-war contemporary avant-garde. David Evrard, working in tandem with graphic designer David Garchey, acts as iconographer by illustrating the text of Douglas Park. He creates a parallel world of images which suggest that history itself can be treated as a found object. Film-maker & poet Jean-Philippe Convert is the interpreter, frantically re-transcribing the unorthodox tales of Douglas Park to facilitate their smooth passage from London to Paris. 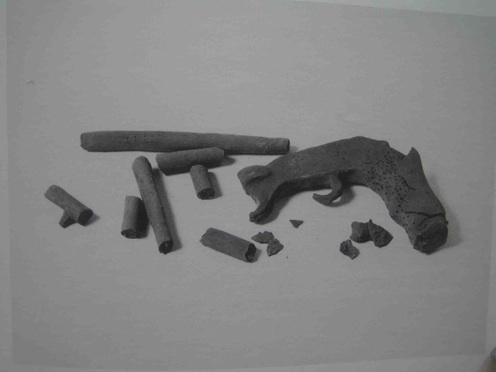 "Fusil brisé" (broken gun) , around 1970, piece created and destroyed by Marcel Broodthaers, then offered to his friend Isi Fiszman.